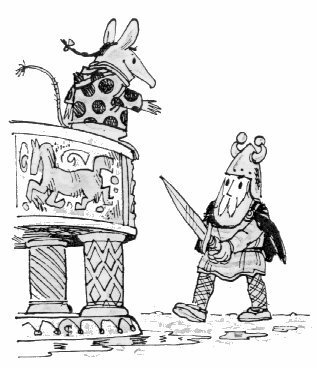 The Clangers actually made their first appearance in the story "Noggin and the Moon Mouse", first published in 1967, though it tells a story that happened 800 years earlier. 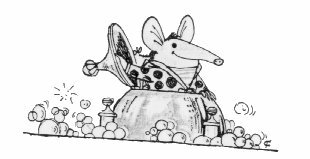 The Moon mouse came to the Land of Nog in a small "ball shaped" spaceship, and made a soft landing in a horse trough! All the Nogs were worried about this new arrival, and so their bravest warrior, Thor Nogson, was sent to confront it. When the Moon Mouse saw Thor approaching, sword raised, it realised the danger it was in, and ran away, squeaking. It all turned out for the best in the end, however, as the Nog children befriended the Moon Mouse, and gave him the things he needed to return home.